Description: Stock image of a boy playing in water at a waterpark. 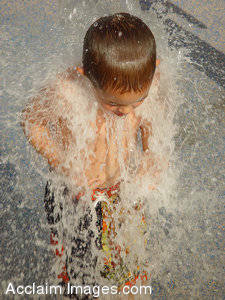 This photo shows a boy playing and splashing in the water of a water fountain in the summer. The boy is about 8 years old and is wearing bright swim trunks and is all wet as the cool water splashes him from below. This picture is available as a poster and may also be licensed as stock photography.